At last! We hear you cry. Yes, We can confirm that Robots in Disguise’s final two Warrior class toys, Bludgeon and Thermidor, have arrived on US retail shelves. They’re arriving in Wal-Marts, such as the Wal-Mart in Prescott, Arizona. 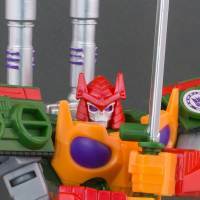 The pair are shortpacks in the final assortment, and are likely to be hard to find – but if you’re collecting Robots in Disguise, both are worth seeking out, particularly Bludgeon, who is a fun toy with a great look to him. But more about him later. Thanks go to TFW2005 member Stygian360 for the heads up! Bludgeon has a great mold (works better for him than for Megatronus, imo)! The funky colors are just a bonus! Here\'s hoping he shows up everywhere soon! I lucked out and managed to pick these up in Canada during a visit. Bludgeon is really great.